Report data provider (RDP) is class that is used to access and process data for a report. It’s used when a report has a complex logic that cannot be achieved by AOT query. RDL is an XML application primarily used with Microsoft SQL Server Reporting Services. 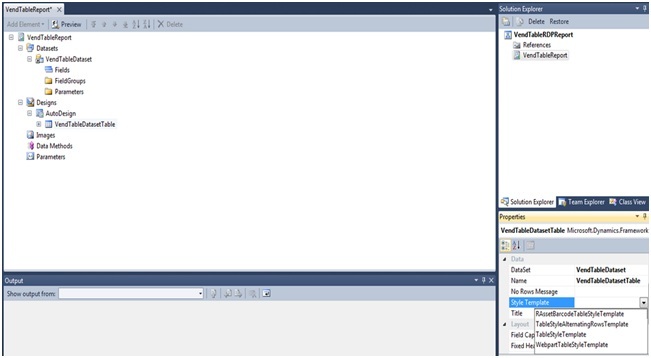 RDL is usually written using Visual Studio. AX has Report Definition Language Contract classes that can generate and build the RDL for an AX SSRS report. The base class is SrsReportRdlDataContract. This attribute specifies the AOT query which is used by this SSRS report. This attribute specifies the Contract class as a parameter. B) Temporary Table: Properties — Table type. There are 3 types of Table type. 2. In Memory: It’s temporary table which is exited in previous version. Such tables are held in memory and written to a local disk. If data set is small like 1000 records, then recommended to use In Memory property. 3. Temp DB: This is new option introduced Ax 2012. They are “physical” temporary tables held in the SQL Server database. If data set is large then recommended to use Temp DB. Create a new method for Temporary table. Process report(): It’s override method to provide business logic for our report. We can use Query directly instead of used while select. Contract Class: It’s use to define the parameter in report. Controller Class: It’s control the report execution. The base class is srsReportRunController. preRunModifyContract ( ): preRunModifyContract is called by report controller before the report is run. prePromptModifyContract ( ): prePromptModifyContract is called by report controller before the parameter dialog is shown to the User. 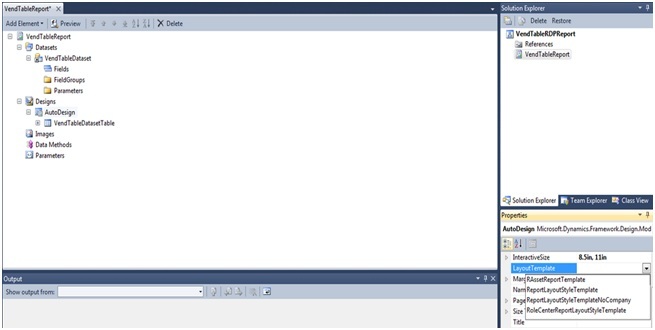 Select Microsoft Dynamics AX in the installed templates. Name your report than click Ok.
Now need to add a report in our project. You can rename your report to VendTableReport. Once we have added the report, right click on the dataset and add a dataset. Right click on your newly added Dataset and select “Properties”. 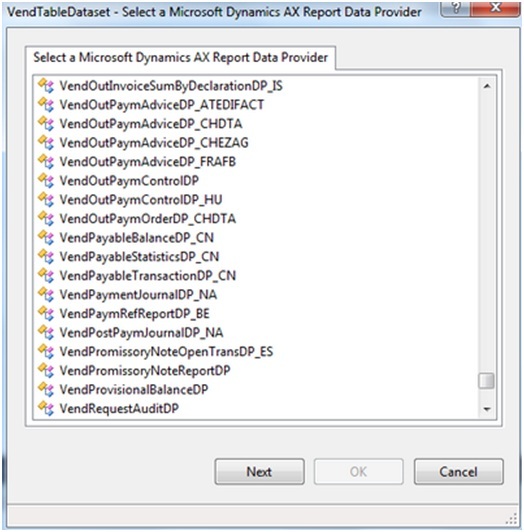 Select “Report Data provider” in the Data Source Type. 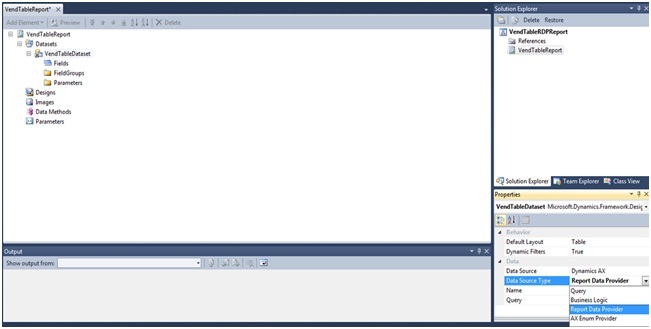 Click on the button provided against the query property and select our RDP class. Now add AutoDesign in our report. We can add an auto design by right clicking on the designs or you can drag your VendTableDataset on the designs node. Select a Style template in the properties of your VendTableDatasetDesign node. The setup is completed. We need to view the report now. In order to do so, build the report by right clicking on your solution. After successful building of the report, deploy the report and add it to AOT. 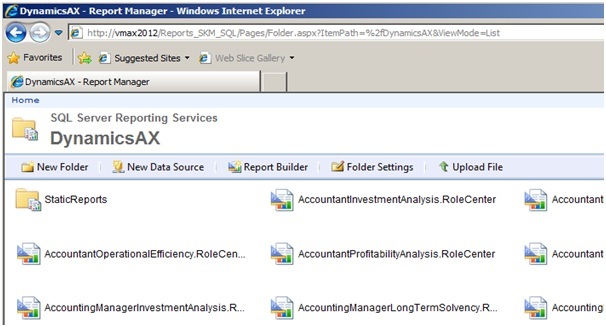 In order to view the report in Dynamics AX, add an output menu item. Select SRRS Report in Report Type. Select your report in Object and report design in ReportDesign. SSRS reports can be published to a number of formats such as PDF, XPS, Excel and Word. In addition, SSRS has an extensible framework that allows you to add plugins to support other export formats. thereby providing end-users with a lot of flexibility and power to access their data.